Strategies for surviving and thriving in our rapidly changing industry, through a focus on the adoption of change. Within the past ten years, the rate of change in our industry has increased rapidly as we continue to react to fundamental shifts in consumer behaviors, markets, regulations, technology and manufacturing. Many times it becomes difficult to sort out what changes are driving what effects, and equally hard to tell which competing strategies will prevail and carry the industry forward. Every retail organization’s future is dependent on the outcome of the industry’s turmoil – even though it is not apparent what the outcome will be. The challenge for retail leaders and management teams is to prepare for any eventual outcome, yet continue to foster success within their current business model. It is a daunting task for sure, but one that must be addressed by every organization that hopes to prosper and grow in the next decade. Charles Darwin gave us the wisdom that “it is not necessarily the strongest or most intelligent who survive, but those that can adapt and change.” Change itself is inevitable, that’s a given. But in today’s business world, the pace of change is increasing. Industries are changing overnight, and some companies that were mainstays of the furniture industry have been vaporized. What is happening in the US home furnishings industry has also happened in many others. The difference is the pace at which it is happening. Instead of a slow, 30 year change cycle such as the auto industry experienced, home furnishings is changing in 1/3 that time. To survive and thrive in such a rapidly changing environment, leadership must focus their efforts on the adoption of change. It’s not enough to have a great vision, a great strategy, or great ideas. The rate at which an organization can mentally understand, behaviorally implement, and emotionally adopt organizational change must also be addressed. Capitalizing on success is no longer enough. Organizations, leaders and managers must learn to profit from failure as well – their own and others – in order to maximize the input and determine the organizational responses needed to thrive and grow. The human spirit is a goal-seeking device. Once an individual is emotionally committed to achieving a specific and clearly mapped goal, extraordinary things begin to happen. This emotional buy-in can easily transfer itself into the core attitude of the company when the right people are involved. Likewise, confusion and disorganization can easily lead to fear, uncertainty and doubt. Building an organization that fosters extraordinary performance from its staff is not complex, but it is difficult. It is not difficult in the sense that the work is tedious, but that all change requires constant attention from an adroit leadership team. Quite often, leadership does not invest in change long enough to foster an adoptive process of change implementation. •What are we trying to accomplish as an organization? What is the “big picture” goal. •How am I, as an important staff member expected to help? •What role do I play, both personally and as a team member, in helping the organization succeed in its mission? •Am I doing well? Am I meeting my personal goals and the goals of the organization as we work towards achievement of our mission? How will my success be measured? How will the company’s success be measured? •What’s in it for me? How will I grow and develop as a result of this pursuit? How will I be rewarded? What is it that personally makes me want the organization to fulfill its mission and goals? •What should I do if I think I am (we are) off track? Who do I go to for help or to offer suggestions, ideas, concerns? One caution when using this list – to ascertain whether or not a staff member knows these answers, leadership and management should refrain from an interrogative style of questioning. Take the time to have lunch with a few associates, and conversationally find the answers together. Keep track of the information over time, and stay away from formalized surveys. Adoptive change requires empathy and emotional support. Successful author and entrepreneur Harvey McKay wrote: “A dream is a dream. A goal is a dream with a plan and a deadline.” Goals are specific, measurable and time-oriented things against which we can map our progress. Priorities are the things we need to focus on right now to get there. Goals and priorities are two vastly different animals. The ability to establish, clarify, communicate and operate according to a simple business goal and fluidly, yet distinctly, set priorities every day, is what separates top performing companies from the rest of the playing field. It all begins with the organizational competence to focus on the goal rather than the means to get there. Many management teams spend too much time defining how to accomplish something instead of looking at what to accomplish. If your organization is facing significant change, leadership can more easily guide its adoption by focusing on the resulting impact (i.e. the goals) rather than the change itself. For example, if a company wishes to lead its market in customer service, but must overhaul its entire internal structure to do so, leadership should focus on getting buy-in for the vision, rather than buy-in for the change required to get there. People are more apt to bring change upon themselves for the greater good than to improve themselves. In fact, the bigger the goal and greater the change required to get there, the simpler the plan needs to be. Many fast moving companies stick to the one-page business plan concept. This leaves room for team members to focus on goals, not specific processes or procedures. This also allows the people who know these processes best to implement new ideas for improving them. While goals are better suited for big strategic items that are further off in the future, priorities define the most important specific things to accomplish in the short term to affect goal attainment. As such, priorities are often shifting, sometimes as rapidly as day to day, depending on the environment. Regardless of this shifting, one thing remains constant. That is, if too many priorities exist,then little will get accomplished. Generally speaking, the best operating scenario is to identify no more than the top five operating priorities for any group or individual. Out of these, then indicate the one priority that is so important that it supersedes the other four. 2006 Strategic Goals for ABC Furniture Store, Inc.
GOAL: Customer re-entry rate to increase from 36% to 80% by June 30. Priority 2: 75% Re-Entry Response to Loyalty Offers. Priority 4: 360 Degree Feedback on Associate to Customer Interaction Skills. Priority 5: Decrease “Best Customer” Delivery Days by 4. Once an organization’s measurable goals are clear and priorities set, it is time to focus on rewards. One common mistake furniture retailers make is to tie only upside incentives to goal attainment. For companies that want to experience rapid change, it pays to also provide disincentives. The easiest way to accomplish this is to begin rewarding ordinary behavior as well as extraordinary behavior. By establishing the minimum performance level that management will tolerate, as well as an unlimited upside plan, a company’s management team can reduce the burden of pushing performance against a fixed pay scale. A good example of this is sales compensation. It is commonplace for furniture retailers to adopt a “sink or swim” sales compensation plan because that’s what everyone expects. However, in many stores, the salability of items in the store is more directly related to marketing and merchandising efforts than the individual salesperson on the floor. After all, a sales associate has absolutely no say in product choice and door traffic, yet their next meal relies on these factors. Additionally, the buyer and advertising agency get paid the same amount whether or not sales associates make sales. 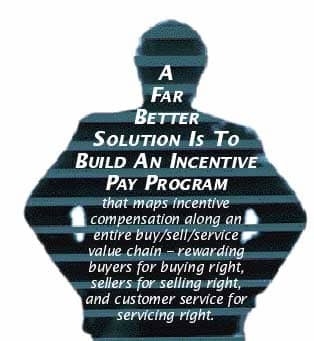 A far better solution is to build an incentive pay program that maps incentive compensation along an entire buy/sell/service value chain within the organization – rewarding buyers for buying right, sellers for selling right, and customer service for servicing right -- collectively and individually. This type of system enables leadership to tie everyone’s future to the same metrics so everyone shares in success and failure. Reward ordinary behavior, not just extraordinary – build a plan that includes everyday heroes. Make incentives substantial enough to matter – Work up to about 30% of total cash compensation. Directly link incentives to business strategy, not just effort. Make a clear connection between the organization’s goals and the incentive pay awards, and be clear on what less-than-acceptable achievement will be. Keep everything transparent and very measurable. Playing games with the numbers helps nobody. If you want the best people, expect to pay them well and in a fair way. Keep the measurements visible daily – daily reinforcement of numbers accentuates the emphasis that leadership places on goal attainment. Compensation is the touchiest topic you will ever address with your staff. Why? Because it’s personal – probably the most personal thing having to do with their job. It’s an establishment of tangible value for a priceless asset. Implementing variable pay systems is a process, not an event. Each organization’s implementation of variable pay systems comes with its own challenges, and there is no formula that can calculate the emotional challenges inherent in this type of change. eadership must demonstrate their understanding, empathy and respect for past performance while leading people to think and do things in an entirely different way. Implemented effectively, incentive pay systems can help to deliver the result that every leadership and management team seeks - motivated execution of the business plan. Adopting changing processes and behaviors as their own. Driving the performance necessary to implement these changes. Clearly defining and articulating goals and priorities regularly. Motivating the entire organization to execute the plan within the deadlines and framework of the strategic intent. It is these “soft skills” and intangible capabilities of teams that ultimately fuel the best of the best. It is these same requisite, but extraordinary, proficiencies that will drive our industry through the current challenges and on to future success. Ren Baker is the president and CEO of CDS Solutions Group, a business and software solutions company. Dedicated to bringing emerging technologies to the home furnishings industry. Baker assists companies in implementing business best practices and automating through software and operating systems. Questions can be sent to Baker at rbaker@furninfo.com.